Nazareth (pronounced /ˈnæzərəθ/ (deprecatit template); Ebreu: נָצְרַת‬, Natzrat or Natzeret; Arabic: الناصرة‎ al-Nāṣira or al-Naseriyye) is the lairgest ceety in the North Destrict o Israel. 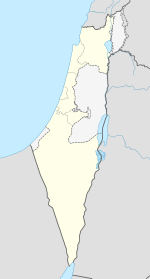 Kent as "the Arab caipital o Israel," the population is predominantly made up o Arab citizens o Israel. In the New Testament, the ceety is describit as the childhood hame o Jesus, an as such is a centre o Christian pilgrimage, wi mony shrines commemoratin biblical events. The Mayor o Nazareth is a Palestinian Christian. ↑ Dumper, Michael; Stanley, Bruce E.; Abu-Lughod, Janet L. (2006). Cities of the Middle East and North Africa: a historical encyclopedia (Illustrated ed.). ABC-CLIO. pp. 273–274. ISBN 9781576079195. Wikimedia Commons haes media relatit tae Nazareth.